Back in 2007, a young bottlenose dolphin really shocked onlookers - because she was completely pink. Now, Pinky is back, still happy, still healthy and, of course, still "pink" - sort of. 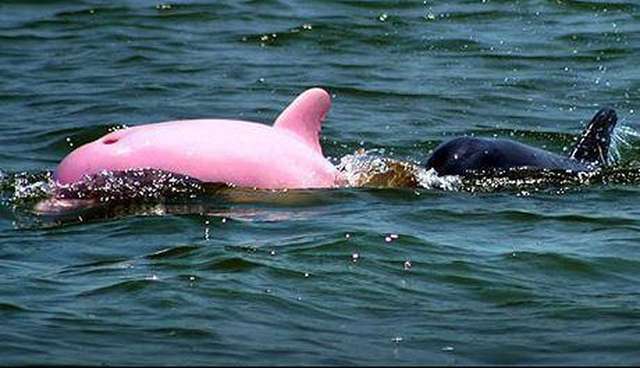 Pinky was originally spotted in the Calcasieu River, in Louisiana, swimming alongside her mom. Her skin's not actually pink, of course: Her incredible coloring likely comes from blood vessels under her layer of blubber that are normally masked by skin pigments. Somehow, Pinky just got lucky. "It is an albino - based on the eyes, which are pinkish," Naomi Rose of the Animal Welfare Institute told The Dodo. "The reason it LOOKS pink is because the skin of dolphins is highly vascularized (lots of blood vessels and capillaries in the skin), and when they are active or hot, these blood vessels expand, and allow the dolphin to dump heat into the surrounding water." "So the pink color is just blood at the skin's surface, like when humans flush or blush," Rose said. "Same phenomenon. 'Regular' bottlenose dolphins do this all the time too, but you can't tell, because their normal skin pigment is gray." Years after first being sighted, Pinky is still around and seems to be doing wonderfully. With albino dolphins, their light color often lowers their life expectancy as they can be seen more easily by prey. Pinky, however, seems to be doing just fine. Marine biologist Dagmar Fertl told Science Blogs that Pinky is one of only 14 known albino dolphins in the world. It's been about eight years since Pinky was originally discovered, and she's aging gracefully - and might even be pregnant, since she's recently mated. There's no way of knowing if Pinky's babies would also be pink, but we can certainly hope. A whole pod of pink dolphins - now wouldn't THAT be fantastic.